The Zojirushi NP-KAC10 is the cheapest Induction Heating rice cooker that is currently sold in the United States. 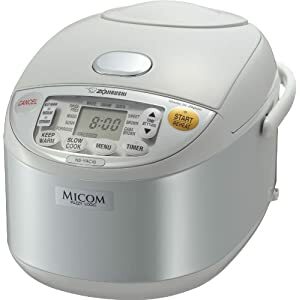 This machine, while being more expensive than other Micom machines is not actually all that much more expensive than the Zojirushi NS-ZCC10 Neuro Fuzzy rice cooker. The benefits of a machine with the Induction Heating function is that the quality of the rice that it makes is that little bit better. Machines with this Induction Heating function cook the rice by the use of a magnetic field instead of a heating element under the cooking bowl. The current makes the whole metal cooking pot heat up evenly which ensures that your rice will be cooked to perfection every time. The Zojirushi brand is the most well respected company in all of Japan. The specialize in the design and production of top quality rice cookers. This particular model is the right size for family cooking. Its capacity is 5.5 cups of uncooked rice which is enough to be able to feed up to ten people. As usual, the you are able to find the best price for this product if you take the time to do some online research. 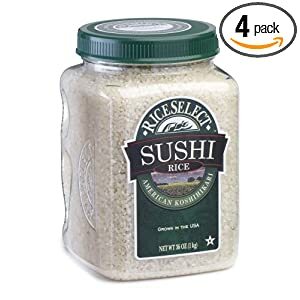 The lowest price that I have discovered has been on the Amazon website. Of course, it is worth spending the time to do your own research but this is a good place to get a benchmark price. If you can find a lower price than on Amazon, you can be pretty certain that you have found the best deal on the web. You can save yourself round about $50 by purchasing the Zojirushi NP-KAC10 rather than the NP-HBC10. Both machines are the same size and can do pretty much the same things. The reason for the lower price includes the following points. Savings have been made in the production of the NP-KAC10 because its body is not the attractive stainless steel design but is made out of hard white plastic. That said, it may well be that a white machine would be more suitable for the color scheme of your kitchen. It also does not have the option to cook GABA brown rice. This is the special cooking setting that takes about 3 hours but produces the most nutritional brown rice possible. Finally it just has a regular LCD display rather than the color display that you get with the Zojirushi NP-HBC10. What Is A Micom Rice Cooker?